Interconnecting several items of MIDI gear can be a frustrating business. Some of your MIDI gadgets may lack the MIDI-thru sockets which are required for connecting several devices together in a 'chain'. Where thru ports are provided, the signal throughput may introduce 'duty cycle' distortion or time delays - so 'chain' performance may be unacceptable, particularly on 'chains' of three or more. The preferred alternative to the troublesome 'chain' is the 'star' network. The only snag is that for a 'star' network you will need more than the single MIDI-out, which is all that may be available on your master controller. You'll need a MIDI thru box to solve this problem by setting up a MIDI 'star' system. A MIDI network may be expanded via a hybrid combination of 'star', and 'chain'. 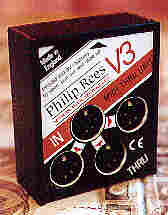 The superb Philip Rees range of MIDI thru boxes (splitters) consists of the battery-powered V3 MIDI splitter, the line-powered V4 MIDI splitter, the externally-powered two-bank V8 MIDI splitter, the mains-powered V10 MIDI splitter and the mains-powered dual-input W5 MIDI splitter. The highly successful V3 is a handy one into three MIDI thru unit, which you can use to convert one MIDI out into three buffered parallel outs. The V3 is very compact is very compact - just 58mm x 69mm x 23mm. You can use a PP3 (6F22) battery to power your V3 - the battery will give a very long life (usually a year or more in normal use. When you leave the IN socket unconnected, or your MIDI master device is quiescent or switched off, no battery power is consumed. You can use and external 6Vdc to 9Vdc supply to power your V3 - you'll have to make connection via a PP3 type snap (press stud) connector with the negative voltage on the male stud. The current demand is just 10mA maximum..
You simply slide out the top side panel to fit the battery or the connection from the battery eliminator. 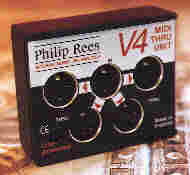 The new V4 is a handy one-into four MIDI Thru unit, which you can use to convert one conventional MIDI Out (connected to the IN socket of the V4) into four cleverly buffered parallel Outs (available at the THRU sockets of the V4). You will find that the V4 is a convenient pocket-sized gadget. Its dimensions are just 58mm x 69mm x 23mm. The power for the V4 buffer circuit is derived from the MIDI connections at its MIDI In socket. This circuit configuration inevitably makes certain assumptions about the master MIDI device: it assumes that the screen connection on pin 2 is the zero volts of the associated MIDI driver circuit; it assumes that the source connection on pin four is derived from a five volt power supply; it assumes that the MIDI driver current switch is connected via pin 5. As the design of the MIDI master device could fail (for good reasons) to meet any of these criteria, compatibilty problems can occur whenever line-powered MIDI gadgets; problems are however rare. The MIDI In and power control circuit of the V4 is designed for best possible compatibility and resistance to damage. It will work perfectly with the vast majority of MIDI master devices. When an incompatible driver is found, it is nearly always easy to rearrange the system to avoid the problem, as in the example which follows. In the example below the MIDI Thru of the Synth Expander is chosen to drive the V4 instead of the incompatible MIDI output of Synth 1. This MIDI Thru box has eight Thru outputs. They are arranged as two banks of four. The sockets for one output bank are on the left hand side of the box. The sockets for the other output bank are on the right hand side. 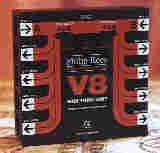 The V8 has two MIDI input ports, marked 'A' and 'B'. The socket for input A is on the left of the box, and that for input B is on the right. There is an INPUT SELECT slide switch for each of the output banks. Each switch has three positions. In the position marked 'A', the MIDI signal received at MIDI IN A is routed to the relevant bank of four Thru outputs. In the position marked '0', no MIDI signal is routed to the corresponding bank of outputs. In the position marked 'B', the MIDI signal received at input B is routed to the relevant output bank. There are two flashing lamps that indicate when MIDI data is being received at each of the MIDI inputs. The lamp signal is pulse stretched so that even sparse MIDI data is readily perceived. A POWER lamp is also provided, which indicates when the V8 is connected to a suitable DC power supply. The V8 does not incorporate its own power supply, so it requires to be connected to an external DC power source. An ordinary mains adaptor (regulated or unregulated) of between nine and twelve volts will do fine. The current requirement is just 30mA. Power connection is made via a 3.5mm jack socket, with the tip positive. TThe DC power is regulated within the V8. Protection against reverse connection is incorporated. The dimensions of the V8 are 109mm x 109mm x 40mm. The V10 is a one-into-ten MIDI thru box, which will convert one MIDI out into ten buffered parallel outs. It will provide your MIDI master device with thru outputs to drive up to ten slave devices in a 'star' network. 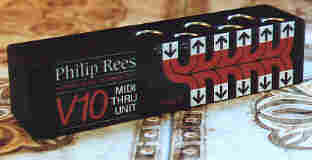 The special Philip Rees MIDI-Thru system peovides effective isolation without the use of optocouplers. This ensures consistent high-speed performance. The mains supply of the V10 is built-in, so no external adaptor is required. The mains lead is permanently fitted, so it won't get lost. It is supplied with a mains plug fitted. There is a POWER indicator lamp. The dimensions are surprisingly compact - 175mm x 40mm x 45mm. 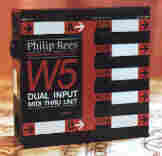 The W5 has five MIDI thru outputs, and two MIDI inputs - with independent source selection for each output. On one side of the W5 are the two input sockets, and on the other side are the five thru outputs. On the front panel are the five three-position slider selectors, one for each output. Each switch can independently link the corresponding output to either of the inputs or a centre 'off' position. The case of the W5 is 109mm x 109mm x 40mm. The integral mains lead comes with a plug. An LED POWER indicator is provided.